Yesterday I wasn’t able to connect to my own WLAN. The day before yesterday I was able, but yesterday I got the message that my network administrator has blocked me from connecting to this network. "Your network administrator has blocked you from connecting to this network". 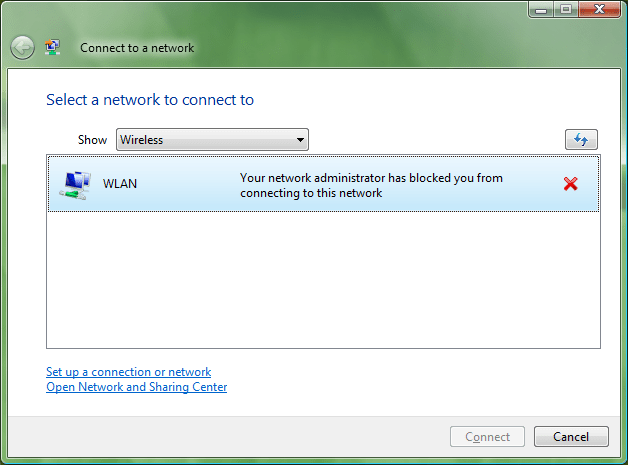 The ironic thing is that I am the network administrator of this network. :-) As I hadn’t installed anything new on my machine, I wondered why my computer wasn’t able to connect anymore. Then I remembered that I got a bluescreen due to my swisscom unlimited card. My computer awaked from sleep and didn’t recognize the swisscom unlimited card anymore. I plugged-in the card again, and then I got a bluescreen. Unfortunately at this moment I was not in my home-wlan, so I didn’t recognize that it didn’t work anymore. So the question was how to unblock this WLAN. I didn’t find any contextmenu or a Dialog to unblock it. So first I have deinstalled the software of the unlimited card. But that wasn’t a helpful idea. My WLAN was still blocked. (Normally the software of the unlimited card (called unlimited data manager) can manage your WLANs, then you’ll see them as blocked. But I didn’t tell the software to manage my WLANs, so I thought deinstalling would help, but it didn’t). After deinstalling the unlimited card software didn’t help, I thought there’s only a way like a real admin would do – by a commandline-tool that gives you a little bit of linux-feeling. Windows Vista contains a commandline-tool called "netsh" – the Network Services Shell. That tool was also shipped with XP and other Windows Operating Systems. 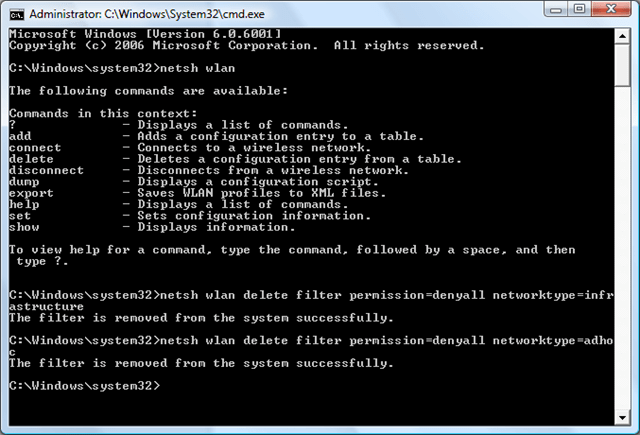 Run that tool from the commandline with "netsh wlan" and you’ll see the available commands for WLANs. I looked at http://technet.microsoft.com/en-us/library/cc755301.aspx, where you’ll find all informations about administration of WLANs by netsh. There you’ll also find the "delete filter" command, that was the solution to my problem. Both times I got the message "This filter is removed from the system successfully". Here’s the Console that shows what I’ve done.